Humanists have told the United Nations: to combat intolerance we don’t need restrictions on free expression, we need more free expression. 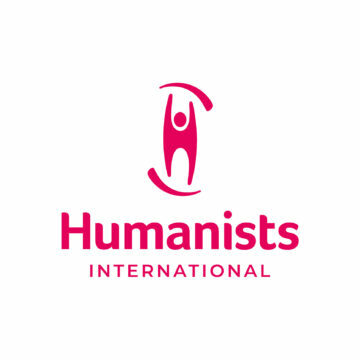 During its final statement to the 35th session of the UN Human Rights Council, the International Humanist and Ethical Union (IHEU) with the support of its sister organisation, the European Humanist Federation (EHF), has urged the Council to bear in mind the crucial role of respecting the rights to freedom of religion or belief and expression plays in combating intolerance. The statement, read by EHF representative, Julie Pernet, was made as part of a debate on the Durban Declaration and Programme of Action, which seeks to to combat intolerance. In it we argued that tolerance can only be fostered by allowing people to express and manifest their beliefs, instead of being subjected to, and silenced by, deeply harmful anti-blasphemy laws, which run counter to international human rights law. We raised four recent cases of particular concern relating to charges of blasphemy, with individuals of different belief-based backgrounds: an atheist sentenced to death in Saudi Arabia; a Christian imprisoned for two years in Indonesia; a Shia Muslim on death row in Pakistan; and a human rights activist threatened with death by extremists in Bangladesh. Manifesting one’s religion or belief can include questioning the instrumentalisation of religion by another for political gain, and challenging ideas where one sees abuse. In April, 29-year-old Ahmad Al Shamri was sentenced to death after his appeal against charges of ‘atheism and blasphemy’ was denied in Saudi Arabia. 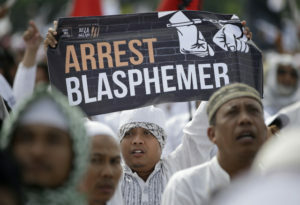 In May, Christian governor of Jakarta, Ahok [Basuki Tjahaja Purnama], was sentenced to two years in prison on charges of blasphemy against Islam after he tried to address attacks from Muslim hard-liners who argued that the Quran prohibited Muslims from voting for a non-Muslim. This month in Bangladesh, human rights defender Sultana Kamal was publicly threatened with extreme violence by Islamist group Hefazat-e-Islam, who misrepresented the comments she made during a TV talk show. Last week in Pakistan, 30-year-old Taimoor Raza, who has a Shia Muslim background, was accused of making a post that made “derogatory” remarks about the Prophet Mohammad on Facebook and sentenced with death. In March, the government said Facebook was cooperating with court-mandated attempts to remove “blasphemy” from the internet. This comes in the wake of a series of “blasphemy”-related incidents including enforced disappearances, a social media crackdown and arrests of “atheists”, and the murder of “humanist” student Mashal Khan. You cannot end intolerance based on religion or belief by selectively silencing speech of religious and non-religious people. In some cases, just the advocacy of one’s belief might be construed or received as a criticism of another’s beliefs; that is the small price we pay for protecting freedom of religion or belief, free expression, and the promotion of mutual understanding for fostering tolerance. We urge this Council to bear in mind the crucial role of respecting Article 18 and 19 of the ICCPR in combating intolerance.